WaterAid's short project description can be found in the file attached as paragraph was truncated. Please see file attached as paragraph was truncated. WaterAid Mali aims to promote the use of low-cost latrines with Sanplat slabs in the communities via the construction of twenty family latrines, ten specifically for demonstration to encourage others to replicate and build their own. To promote replication, the first group of individual households in the community will pay half of the total cost of the Sanplat slabs through a credit system which will end following a four-month cycle. The revolving funds will then be used to assist the community in replicating the projects in other areas. The project calls for the construction of waste pits, again including demonstration pits, to improve environmental sanitation, and in particular, to ensure less groundwater contamination during times of floodingâ€”a large issue in Dialakoroba during the rainy season (almost half the year) as the villages are situated near the mouth of a river. Across WaterAid West Africa programs, the Local Millennium Development Goals Initiative (LMDGI) is being utilized to address and decentralize the national MDGâ€™s on a tangible and local level. Encompassing six countries in the West-African sub-region: Burkino Faso, Ghana, Mali, Mauritania, Nigeria and Senegal, the initiative engages local partner NGOs as the operational implementers, in partnership with local government institutions, with the objective of motivating local stakeholders to mobilize and recognize the potential resources in the region. 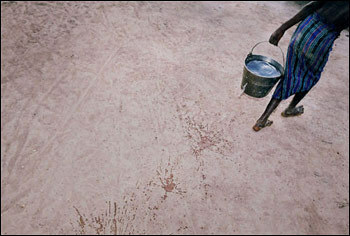 â€¢participating in the implementation of the water and sanitation projects. Seems very appropriate to scale up maintenance training. What is the incentive for the people to become trained in maintenance? Do they receive payment when they provide maintenance? I like the microcredit piece. Are people in this area familiar with credit? If not, does the project include financial and/or numeracy training to encourage payback of the loans? A great way to learn from each other and share approaches. How can Blue Planet Run help in arranging this meeting? Would love to see this meeting happen and some of the learning of the project and organizations shared on PWX. Thanks WaterAid for the great proposal. I think it will provide good lessons for us all. 1. water point rehabilitations often fail because the underlying causes of previous project failures is not addressed during the rehabilitation work. You have identified 2 problems (lack of access to spares and pump mecanics) as problems. Are there other problems (finance, managerial at local level, etc.) that have also been considered and how? 2. The revolving credit scheme is interesting. Are all families able to pay half the cost of the slab? Who is responsible for other inputs? What happens if a family can not pay? 3. How is groundwater protected with these latrines? 4. How will you measure if 1000 have actually changed behaviours? What behaviours have you targeted? Good questions - thanks. Would like to also know a bit of the history of the project - looks like a previous attempt did not work. My question is invovling some of the program side of WaterAid in PWX. Right now WaterAid NY is part of PWX and to get more project details and answers, do we need to get the UK or Mali office involved? Is that possible? Appreciate the emphasis on education and the detailed plan, but would like to know if the demonstration latrines and waste pits will be open to the public? A sound project with some real innovation in the credit scheme. I think the challenge will be with hygiene, but there is alot we can gain from this project as its ideas are useful and replicable elsewhere. It's hard to tell without a detailed proposal but the cost seems high. Would be nice to emphasize the cost-recovery component. What will paid back loans be used for?